Russian Video: Kidnapping Caucasian Style (Movie with English Subtitles)! As always at weekends we will watch a full-length Russian movie with English subtitles. 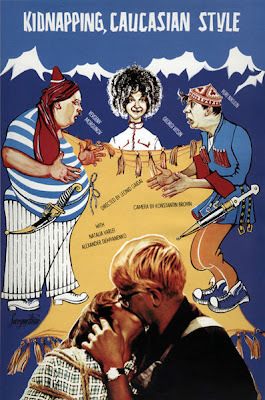 Today it will be a famous old Russian comedy movie “Kidnapping Caucasian Style (Shurik’s New Adventures)” (Кавказская пленница или Новые Приключения Шурика), 1967. Our regular readers already got known Shurik (Шурик) a main character in another movie of an outstanding Russian movie director Leonid Gaidai “Operation Y and Other Shurik’s Adventures” (Операция Ы и Другие приключения Шурика). And yes in this romantic comedy we’ll meet again the comic trio of crooks Experienced, Coward and Fool. And now they will be again up to no good! So lets watch: One of the best Russian comedies ever! This entry was posted in Gaidai, Movie for the weekend on August 1, 2009 by admin. Pingback: Russian Video from Russia: 500 Posts! The only thing is that the video resolution for these movies are very poor. Is there any another way I could watch them with a bit higher resolution? How can I watch the movie on my TV screen rather than on the computer? Is there a way to watch the movie on my TV screen? I can stream through Netflix and Amazon on the TV screen.